Within two years of starting my bachelor’s degree I knew I wanted to pursue a research and academia-based career. The journey that has unfolded through the course of me realising this path has brought me from a coastal town called Visakhapatnam in India to Cranfield University in the UK – with a brief stop in the Netherlands! I had the opportunity to study my Bachelor’s degree in remote sensing and image processing. The choice of the course was based on the pre-University exams in India. The fourth year of my undergraduate program required the completion of a research project. I began to work with a supervisor, Prof K Nageswara Rao, who was – and still is – a very influential person in my career. He was instrumental in showing me the real pros and cons of a research career. I was attracted to research because it gives me the opportunity to govern my own interest and applications. My thesis supervisor prepared me for the fact that there might be multiple failures before one big success and counselled me that I needed to consider whether I could deal with that way of working. Being made aware of that before I fully embarked on my career was invaluable. The research output of looking into coastal erosion at deltas in India under his guidance was well received and published. After my bachelor’s degree, and knowing that I wanted eventually to do a PhD, I moved on to a Master’s program based in Dehradun (in India). This was a joint MSc program between Indian Institute of Remote Sensing and ITC, University of Twente (in the Netherlands). The combination of highly-focused research and a first-time visit outside India (imagine an eager 20 year old backpacking in Europe!!!) to the Netherlands further strengthened my motivation for doctoral research. I investigated the application of classification algorithms in hyperspectral imaging for the completion of my degree, before moving on to biomedical imaging for my doctoral studies. When the time came to decide where to do my PhD, I was attracted to Cranfield because of its purely postgraduate nature, and the research opportunity in the biomedical domain – an area that I had become increasingly interested in. The relative emphasis on the research outputs and their deployment for immediate application in this domain was a significantly attractive prospect. Also important was that the funding was available – which, of course, is a key factor for any prospective PhD student! People often ask me to explain my research to them. The simplest way to think about it is to ask: “Have you been to an emergency room or had your vital signs taken in hospital? Have you noticed that a nurse plugs in a little device to your fingers to monitor your heartbeat?” The ultimate aim of my research is to be able to do the same thing without touching the person. There would be lots of benefits to that; for example, to understand how oxygen is transported in live tissue, while performing a surgery. On an operating table, you can’t plug an oximeter to the stomach wall or to an organ – my research aims to develop a method that is non-contact and non-invasive. There are other commercial, applications of this kind of technology too. We’re all aware of the increasing use of fitness monitors like Fitbits – but if you really want to understand biochemical or biophysical elements of skin or organs you need a much more complex system. In terms of the day to day life of a researcher, I would say it is very mentally taxing. You make your own schedule, and can work extremely long hours one day, and then fewer the next day – but you work under the constant pressure of knowing that the end result must be novel and advance science. I think we can all agree that that’s no easy feat! It’s a weight on researchers’ shoulders, which requires extremely high levels of dedication. You have to be prepared to really and truly immerse yourself into a topic; but it’s very important to remember that you’re not alone! That can be difficult as you might be the only person working on your area of research, and there’s no classroom environment or a group project scenario, as you might find during your bachelor’s or master’s degree. You’re the only person doing what you’re doing, but it’s good to talk to other researchers. Despite the fact that they’re not specialists in your area, they will undoubtedly understand the emotional challenges of a PhD, so I would definitely recommend seeking and offering support amongst your fellow researchers! My friends and family have been very supportive during my research term. Although they have no technical expertise about my research, to be able to talk to people who have no preconceived ideas is hugely beneficial. Sometimes that different perspective is just what I have needed to have a new idea! I live in Watchfield, quite close to the Defence Academy of the United Kingdom in Shrivenham, where Cranfield University’s Centre for Electronic Warfare, Information and Cyber is based. There are some unique opportunities that have arisen from sharing a location with the Defence Academy. I have a new-found interest in clay pigeon shooting because there’s a range on campus! I have also been able to indulge my interest in model plane making. It’s a long-held passion of mine that I have been able to realise in the last couple of years, mainly because there’s much more interest for it here in the UK, and there are lots of very knowledgeable historians (not the academic kind!) here, including my research supervisor, which is a very happy coincidence! And I have to say, without my supervisor, Dr David James, I definitely wouldn’t be able to do my PhD. David’s contribution deserves so much more than an acknowledgement in my thesis. I have great respect for him as a person and a researcher and I’m sure that having a personal friendship as well as a professional and academic relationship has really helped my research – our work has already featured in four research publications! If I was to give any advice to someone thinking of doing a PhD, I would state the obvious: funding is very important! But there are other, equally important, factors. Make sure you feel confident that you can work with your research supervisor, and really look into how active they are as a researcher – trust me, it’s highly relevant! Those that are extraordinarily famous in their area might not necessarily be the best supervisor for you, so don’t just be attracted to the big names. If you are a fresh master’s graduate you might want to look for someone who can give you lots and lots of support. A PhD is very hard and challenging, and it can be easy to feel overwhelmed – but as I said earlier, you must remember you’re not alone! You’ll need to adjust to the idea that you’re no longer being assessed in a comparative way – your work isn’t being marked in relation to a class of peers around you. When you do a PhD, you’re only being judged against yourself, and that is something you need to accept and deal with, constructively. Also, personally, I had a very steep learning curve and you would want a research team that is supportive of this! More than anything else, I am motivated by a love for the subject that has never waned. While it is very challenging, what makes it worthwhile is knowing that you’re contributing to the advancement of science; this is our route to immortality! We’re still reading literature from the 30s and 40s and I know that, if I do well, my research will be read in decades to come. 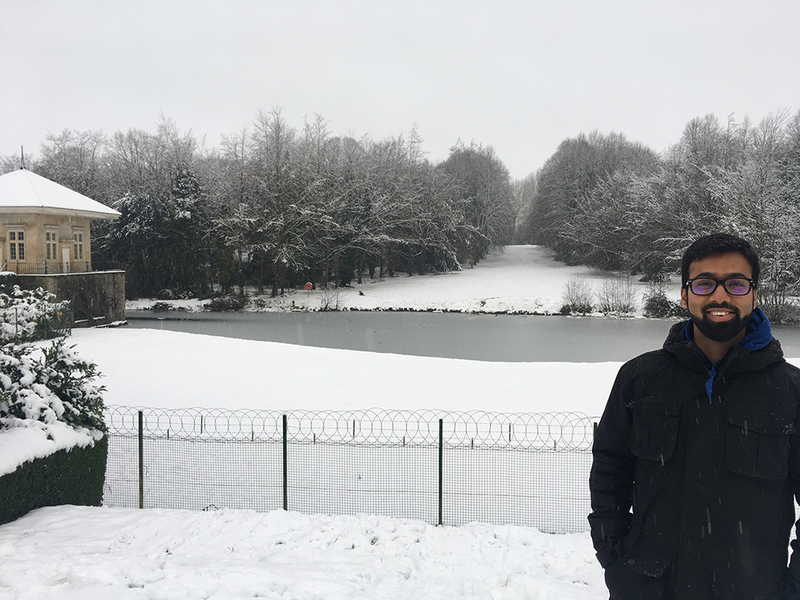 Akhil is a PhD researcher at Cranfield University, looking into biomedical applications of light transport through tissue in non-invasive and non-contact methods. He has a keen interest in multi-sensor and multi-modality imaging applications for cancer research and optical investigation of tissue. Last year, he was also Vice President of the Cranfield Students' Association. Excellent Akhil…may God help u to achieve your goal. Thanks for the great advice, my sister will be starting her first week of teaching soon and I’ve been trying to help her out. I will definitely have to pass on your advice about starting a management system very early on to her. It might even help for her to find all of the right programs and stuff that she can use for scheduling ahead of time as well.